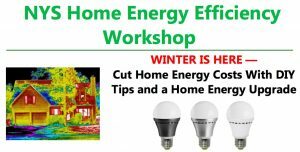 Attend a residential energy efficiency workshop at the Hudson Area Library, 51 N. 5th Street, Hudson, NY, on January 28 at 11am, hosted by James Kopp. Even with the current relatively lower cost of energy, getting a home energy upgrade can help you cut utility expenses, live more comfortably and mitigate climate change. Se habla español. The event is free and open to the public and will be in the library’s community room, which is wheelchair accessible. A free, or reduced cost, NYSERDA Home Energy Assessment and Energy Report gives you the information needed to determine a scope of work for an energy upgrade. 92% of New Yorkers qualify for a free assessment with no obligation. Mr. Kopp will discuss your home energy needs, walk you through NYS’s energy programs and suggest DIY tips you can do yourself. Energy Report: Learn how to apply and what Home Performance Contractors do during the home energy assessment. Get an Energy Report that details issues about health and safety, air infiltration, insulation, heating, lighting and appliances and payback periods. Incentives: Learn about financial incentives. Middle to low income families qualify for a 50% discount up to a $4,000 cap, or $8,000 if your home has two to four units. Low Interest Loans: Learn about low interest loan options and how you can arrange your loan so monthly payments are less than the average energy savings per month. Free Services: Low-income families qualify for free services through EmPower NY. Help spread the word, tell your neighbors about the workshop, do your part to save energy, live more comfortably, and address climate change. NYSERDA, a public benefit corporation, offers objective information and analysis, innovative programs, technical expertise, and funding to help New Yorkers increase energy efficiency, save money, use renewable energy, and reduce their reliance on fossil fuels. RUPCO, a nonprofit housing organization is a NYSERDA contractor doing outreach to homeowners. This entry was posted in Adults, Programs and tagged Energy Savings by Brenda Shufelt. Bookmark the permalink.